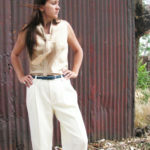 We started making custom made-to-measure blouses for women a couple years ago. 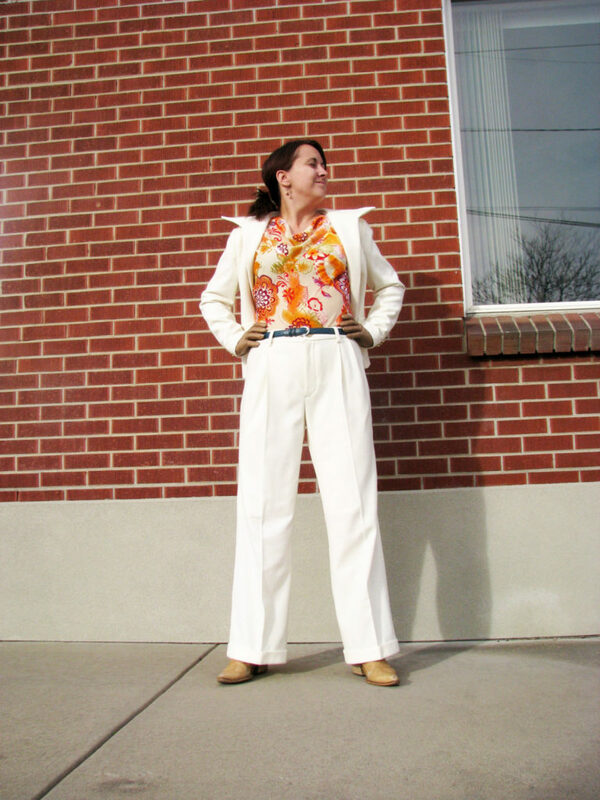 Many of our clients weren’t quite sure what to wear with one of our suits and struggled to find something that looked right without being too masculine or boxy. 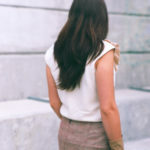 Although we do make buttondown dress shirts for guys, we tend not to love the way that dress shirts look on curvier women—they always seem a bit too tight to too loose or even both at the same time. But on the other hand, we didn’t want to do knit blouses—-there are so many cheap knits out there that clients could always find something if they wanted to go with that (less formal) look. Instead, we began developing “bias cut” pullover blouses. Fabric that is “bias cut” is cut diagonally across the fabric so that the grain runs at a 45 degree angle. This method of cutting uses much more fabric, but creates a piece that is quite stretchy and drapes beautifully. These blouses can also be made from the most gorgeous of our woven silks and wools—the result is crisper and much more formal than a knit, but still has all of the great qualities that we associate with knits. 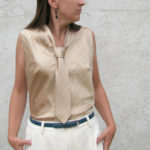 The first blouse pictured is our take on a “shirt and tie”. 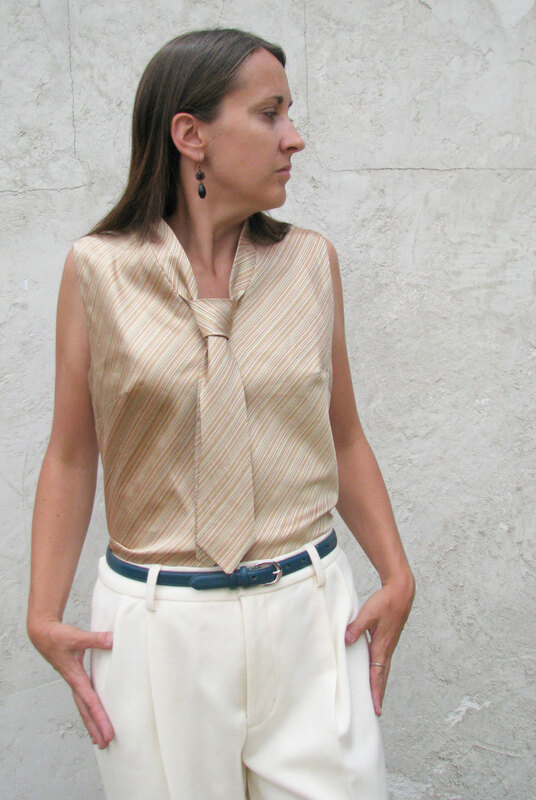 The blouse is entirely made from a gorgeous necktie silk with subtle multi-colored stripes. 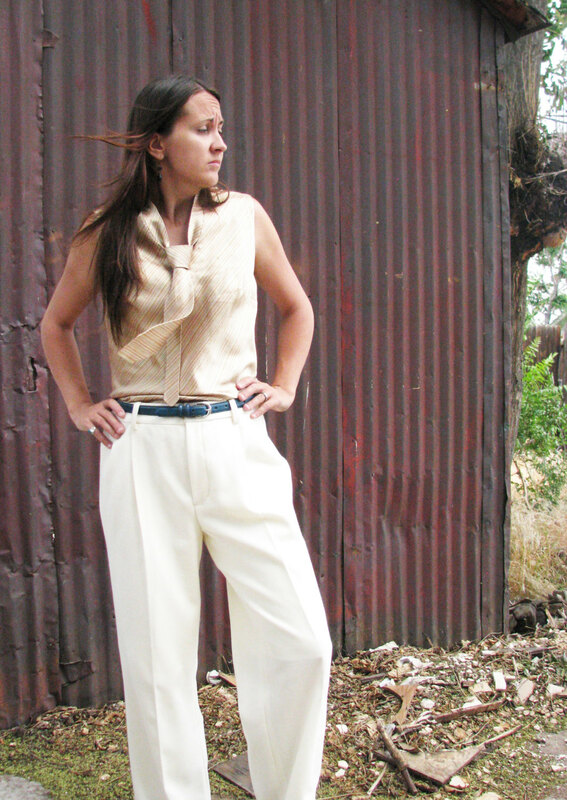 This piece is pictured in a sleeveless version, but all of our blouses can be made sleeveless, with cap sleeves, short sleeves, 3/4 sleeves, or long sleeves with any style of dress shirt cuff. As each piece is completely custom, we can mix and match any details to get the perfect look for you. 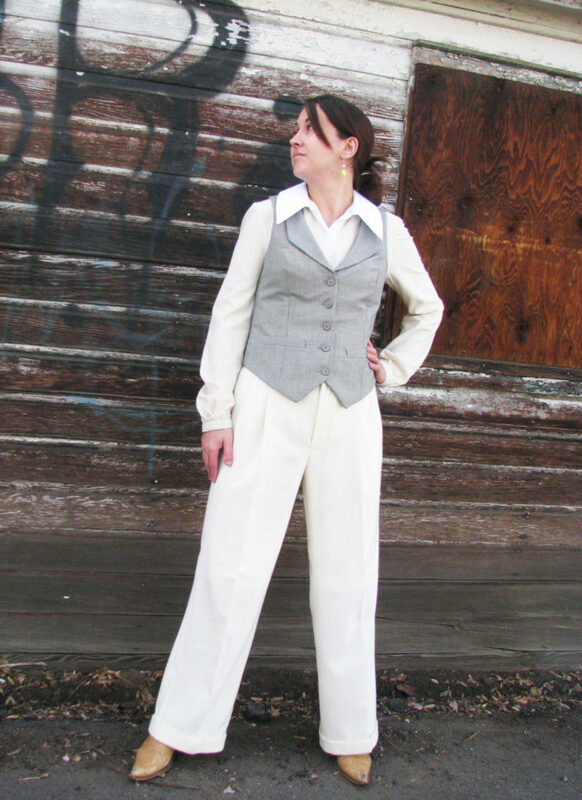 The second top has a large 1920s style collar and bloused cuffs with gathering. This shirt is shown made from off-white silk noil (a soft “raw” silk with short fibers) with a bright white-on-white striped cotton collar. 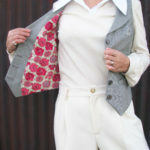 The result is a feminine take on the dress shirt with an utterly soft and stretchy body and sleeves and a crisp collar. The third top pictured is also made from a soft silk noil with a surplice front with gorgeous iridescent silk duppioni ruffles. 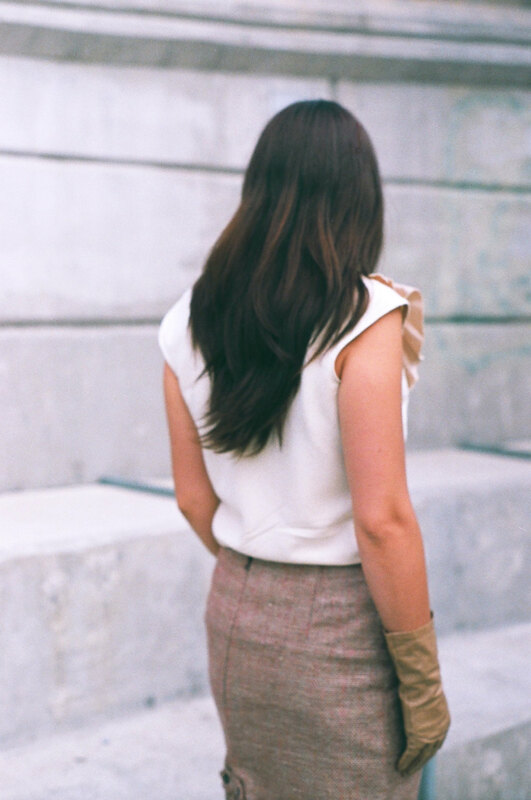 This piece is one of our sportswear looks and is pictured with a silk tweed pencil skirt that we made—a piece like this is great for business or pleasure. 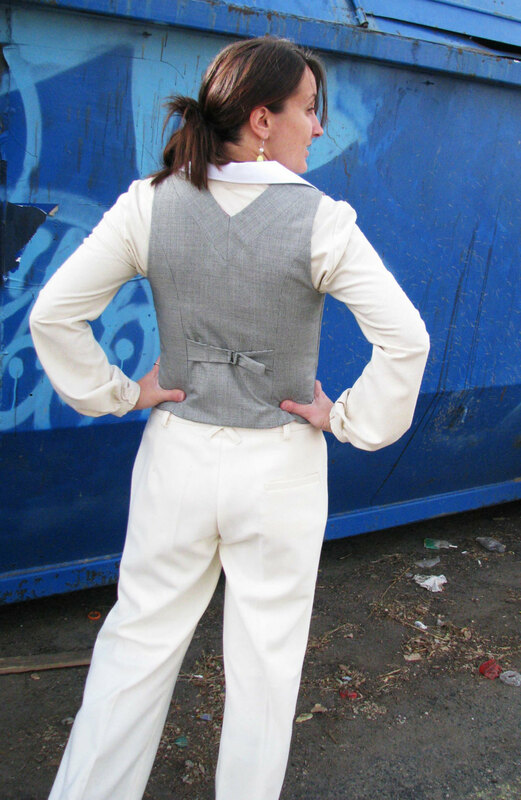 This look also shows our cap sleeve. 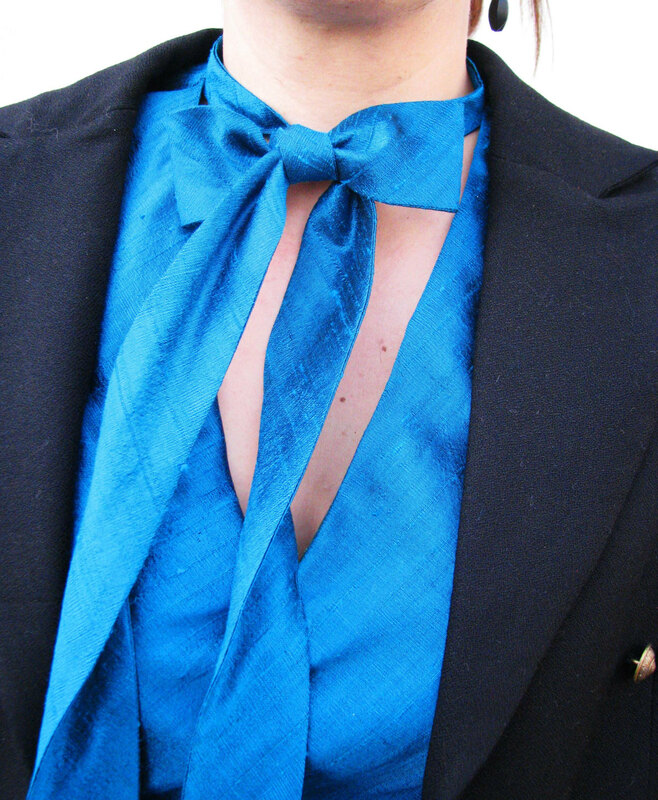 The tuxedo top shown here in blue silk douppioni is another version of our necktie look, but here in a more formal version designed to look great with one our tuxes. 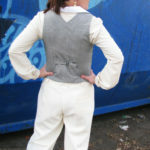 The top has a built in bowtie and cummerbund. The ties can be tied in a bunch of different ways. 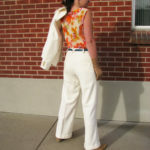 We can get a over a hundred different colors of silk for this look. 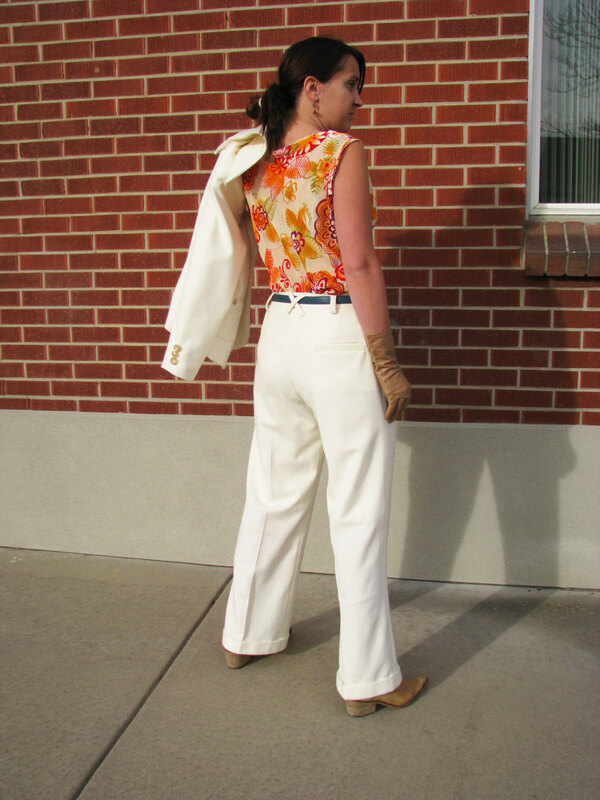 The look with the orange and yellow silk burnout velvet is one of our cowl neck styles. 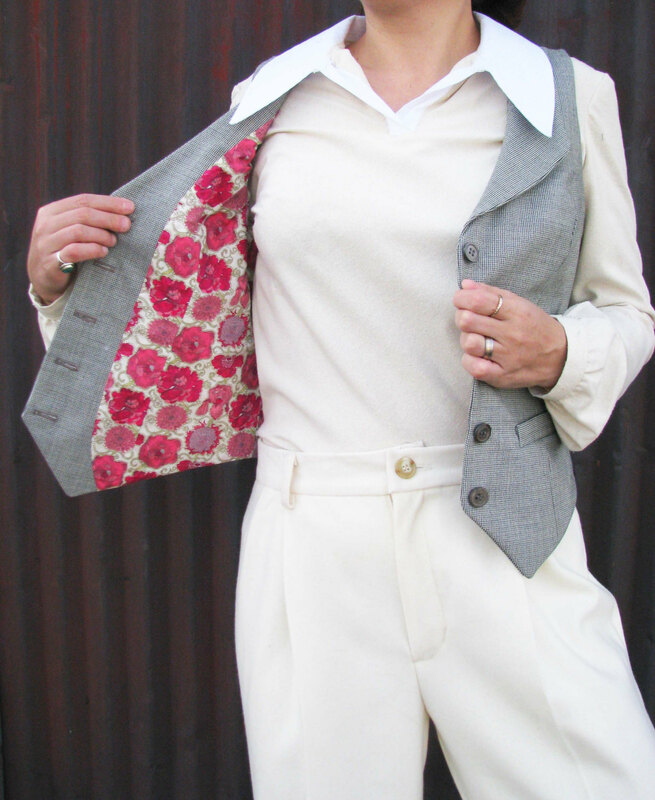 The draped triangular inset looks gorgeous with lots of our suit and vest styles. 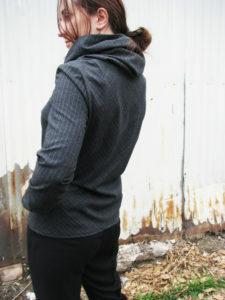 Finally, the last few pics show one of our hoodie tops. 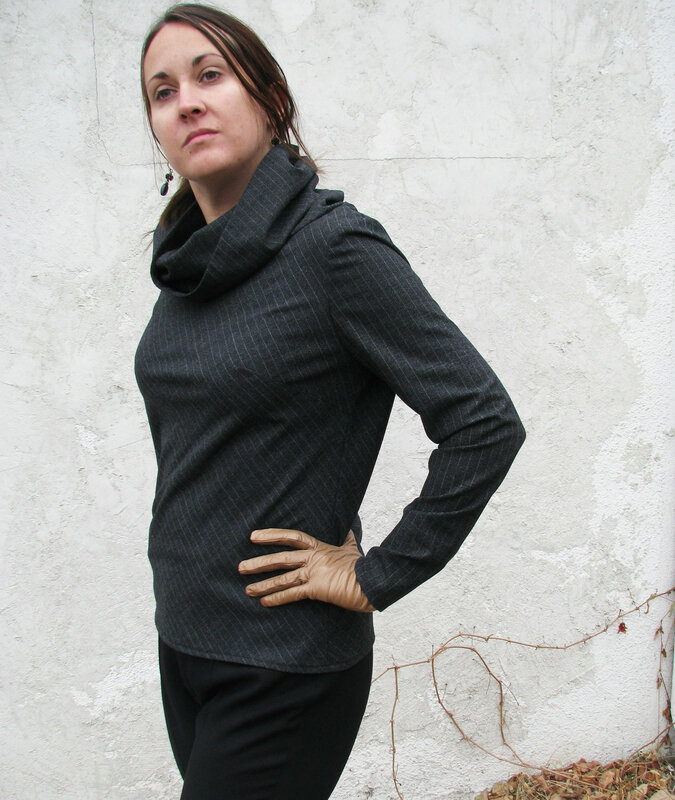 This blouse is cut from a gorgeous superfine wool menswear fabric. 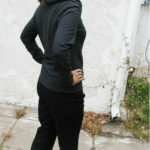 The result is a gorgeous pullover that can be layered into all sorts of gorgeous outfits. 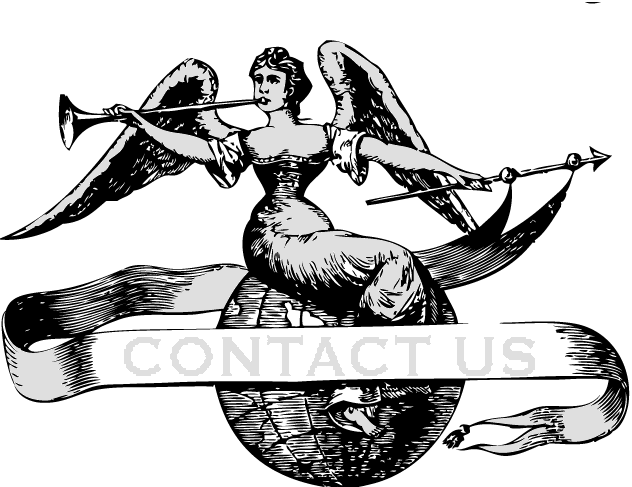 We can really make almost anything you are looking for!